SIT Programmes are NZQA approved and recognised SIT International Prospectus 1 worldwide. GET THE FUTURE YOU DESERVE Join thousands of students from New Zealand and around the world. Choose our quality programmes, modern facilities, famous southern hospitality and world class environment. John Wright (JWS) Scholarships Every year SIT awards full and partial John Wright Scholarships to high achieving students who have a proven track record of outstanding achievements in either sports or academics. This scholarship is available to students mainly from India, Sri Lanka, Pakistan, Bangladesh and Nepal. Please check the SIT website for scholarship eligibility criteria, terms and conditions. Zero Fees Foundation (ZFF) Scholarships SIT offers a range of Zero Fees Foundation Scholarships to students that need further academic entry skills to apply for certain diploma and degree programmes within SIT. Please check with your agent or the SIT website for further details. 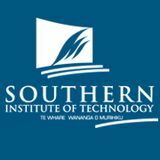 Haere mai, welcome Welcome to the Southern Institute of Technology (SIT), one of New Zealandâ&#x20AC;&#x2122;s largest government institutes of technology, and home to the 26 Week Zero Fees English Scholarships. SIT is here to help you achieve your academic and career goals. By choosing SIT, you will get the best of both worlds. Not only will you gain a challenging academic education, you will also gain real-world experience thanks to our strong links with industry and employers. We combine the best of tradition with cutting-edge technology. With a history dating back to the 1880s, SIT has a proud record of quality education and training. We have also gained a reputation for innovation, developing New Zealand leading qualifications, facilities and opportunities for students. With over 13,000 students and 200 programmes, SIT is large enough to offer you variety and a student culture, yet small enough to retain a friendly atmosphere and personalised learning with small class sizes. Combined with your education, we will help you achieve your academic and career goals â&#x20AC;&#x201C; whatever they may be. I hope to see you on campus soon! Southland â&#x20AC;&#x201C; a genuine Kiwi experience! Southland is New Zealandâ&#x20AC;&#x2122;s southern most province and is a region of rich natural contrasts, beauty and wildlife, boasting quality tourist destinations. The population of Southland numbers around 100,000 people who have an international reputation for being incredibly hospitable to visitors coming to the region. Primarily an agricultural economy, Southland has gained a top reputation nationwide as a region for producing innovative, high quality, tertiary education programmes. Invercargill, the capital city of Southland, has a population of 55,000. It is big enough to cater for your lifestyle needs, yet small enough to provide a stable and friendly atmosphere in which to focus on your study. Invercargill is situated on the southern coast of New Zealand. The commercial heart of Southland, it is a flat, spacious place, where it is easy to find your way around and enjoy a variety of shops, restaurants and cafes. Accommodation and living costs are considerably lower than in other major cities in New Zealand. There is a progressive increase in the number of students and tourists coming from China, India, Korea, Indonesia, Nepal, Russia, Philippines, Sri Lanka and Brazil. Invercargill is the gateway to popular tourist destinations such as Queenstown, Stewart Island and Catlins, which are all within driving distance for a good day out and a return trip before evening. Few regions in New Zealand can better the diversity of mountains, lakes and fiords, historic gold mining towns and lush countryside that Southland has to offer. The Southern Institute of Technology (SIT) is an innovative and forward thinking institute of technology offering cutting-edge qualifications. Thanks to our modern facilities, qualified staff, and strong links to industry, we prepare graduates for success in New Zealand and around the world. Quality Assured SIT holds quality assured status from the New Zealand Qualifications Authority (NZQA). Continuing self assessment processes and external evaluation and reviews conducted by NZQA mean that all our programmes are guaranteed to be of the highest quality. Accredited and Approved SIT’s programmes are accredited and approved by NZQA from certificate up to master degree level. We have over 200 programmes across a wide range of subject areas. Our programmes range from short courses, certificates, diplomas, undergraduate degrees and postgraduate qualifications, up to masters degrees. ªª Phone card ªª Compulsory textbooks and course related materials ªª Comprehensive orientation programme ªª Information and assistance on accommodation options ªª Employment workshops ªª One on one help with your curriculum vitae ªª Regular job opportunities ªª On campus health nurse, counsellors, learning assistance, activities officer and chaplain ªª Visa assistance ªª We also offer subsidised bus trips to Queenstown and Dunedin at the weekends! *Free accommodation is not available to study abroad or Exchange Students. Code of practice compliant SIT is signatory to the Education (Pastoral Care of International Students) Code of Practice 2016. The SIT international team and key staff across the institute are all trained in the Code of Practice regulations. with utensils and white ware supplied. Students will receive their first two weeks of accommodation free*, on a shared room basis. Student also get an Accommodation Welcome Pack consisting of; a set of sheets, mattress protector, pillow, pillow case, duvet, towels, face cloths and a food parcel for your first breakfast. All units have common areas such as shared living spaces, kitchen & dining, bathrooms with separate communal laundries on site. You can also live with a Kiwi family in a homestay, which will help you settle into the New Zealand culture easily. Even with a homestay host, you don’t need to worry about the first two weeks: your accommodation is on us! Extra information: ªª Bond - Each student will be required to pay a $300 deposit and 4 weeks rent in advance ªª Communal laundry: washing machines are $2 to use, $4 for dryers ªª Power is included in the rent ªª Free wifi ªª Single rooms may be booked, but this is subject to availability. 11 Copper Beech Road, Frankton, Queenstown Located in close proximity to SIT’s Queenstown campus in Frankton, the SIT Queenstown Apartments are just 5 minutes drive from the Queenstown Airport. Consisting of 9 units, these modern, state of the art units all have three bedrooms with ensuite bathrooms, shared living, kitchen and dining areas. Each unit also has their own laundry area with a washing machine and dryer. Two of the bedrooms are on triple sharing basis with a bunk bed and one single bed, and the third room on twin sharing basis. OUR CAMPUSES INVERCARGILL, QUEENSTOWN, CHRISTCHURCH & AUCKLAND. INVERCARGILL CAMPUS SIT’s main campus is located at 133 Tay Street, Invercargill. On campus facilities include a student gym, bookshop and cafe, and support services such as a health nurse, counsellor, chaplain, learning assistance centre, disability liaison, Iwi liaison and Pacific Island liaison. The ‘Downtown’ campus is located on Don Street and it is very much a creative zone, housing our Art, Design, Photography, Film, Animation, Music, Audio, and Fashion students. These areas work closely together, often collaborating for live performances, exhibitions and filming opportunities during the year. One of the greatest things about Invercargill is the relatively low cost of living. If you’re intending to go flatting, you can expect to find a good, warm house for $100 – $150 per room, per week (plus expenses). Invercargill’s world-class sporting facilities include NZ’s only indoor cycling velodrome (SIT Zerofees Velodrome), brand new water-based hockey turfs on par with the Beijing Olympics, an Olympic-size swimming pool and a huge indoor stadium. As well as having numerous beautiful parks and gardens within the city, Invercargill is the gateway to some of New Zealand’s most beautiful scenery and destinations including the Southland heartland, Stewart Island, Fiordland, the Catlins and Central Otago. QUEENSTOWN CAMPUS SIT’s Queenstown campus provides an unique opportunity to study in New Zealand’s world-famous adventure tourism capital. Advance your career in hospitality, tourism, business or information technology while enjoying the superb Queenstown lifestyle. SIT’s expanding Queenstown Campus (established 2009) is conveniently located in the Remarkables Park Town Centre at Frankton, with the spectacular backdrop of the Remarkables mountain ranges. Our modern facilities provide an exceptional teaching environment; new purpose built spaces, magnificent views, ample parking and is easily accessible by public transport. Our programmes link strongly with local industry, providing a number of opportunities to engage with employers and industry experts. Our academic staff are drawn from industry, with most still working in their fields, helping bring real life experineces to the classroom. With countless hotels, resorts and luxury retreats in and around Queenstown - not to mention a host of adventure and hospitality businesses - there are a number of employment options for students. SIT Queenstown brings you the opportunity to enjoy the adventurous Queenstown lifestyle, whilst studying towards an industry recognised qualification. English Language As a fully owned subsidiary of SIT, the Southern Lakes English College (SLEC) partners with SIT to offer the Zero Fees English (ZFE) Scholarships (Conditions apply), to international students studying in Queenstown. This partnership provides an opportunity for students to undertake up to 26 weeks of free English, preparing the student for their mainstream course of study at the SIT Queenstown campus. SLEC delivers the General English plus Examination Preparation (Training Scheme) and NZQA approved English proficiecy assessments. As the students will be SIT students, they will receive the full range of benefits offered by SIT including free airport pickup; two weeks free accommodation (when they first arrive in Queenstown), academic support, pastoral support and so much more. SIT Christchurch is a small friendly campus that offers you specialised training in a number of areas including; carpentry, automotive, electrical, collision repair, refrigeration, project management and mental health. This campus is focused on providing skilled trades and technically qualified graduates to assist with the Christchurch rebuild, focusing mostly on entry level qualifications taken up by domestic students. SIT has partnered with the Music and Audio Institute of New Zealand (MAINZ) to establish a presence in New Zealand’s commercial capital, Auckland. The campus is located on Victoria Street West, in the heart of central Auckland’s education and business precinct. Unfortunately International Students have limited study options at our Christchurch campus. In addition to a range of Music and Audio Production Programmes SIT delivers the New Zealand Diplomas in Business (Level 5 and Level 6), which lead on to the Bachelor of Applied Management and associated Graduate Diplomas. The New Zealand Diploma in Business in an ideal entry level programme that allows students to learn about how businesses are run. With highly skilled tutors you learn in a friendly and welcoming environment that supports you to achieve your study and career goals. The SIT difference can be experienced in Auckland; you will get free airport pickup, your first two weeks accommodation free with a homestay host, and all of the other benefits of being an SIT student. POPULAR PROGRAMMES Entry criteria and prices are subject to change. For full details on entry requirements for all our programmes please visit www.sit.ac.nz. SIT accepts all major English proficiency test results as provided by NZQA. Please refer to our website for full details. Unless stated otherwise, programms listed below are offered at our Invercargill Campus. Academic entry requirements: Degree holders and/or applicants that can demonstrate equivalent practical, professional or educational experience in a related discipline may also be considered. Bachelor’s degree or graduate diploma or postgraduate certificate or postgraduate diploma with at least a B grade average at level 7 or higher. Students will have completed all requirements of a bachelor’s degree or graduate diploma in a relevant field (such as chiropractic, health sciences, massage therapy, medicine, naturopathy, nursing, occupational therapy, osteopathy, physiotherapy, sport and exercise) with at least a B average at Level 7 or higher. Bachelor’s degree or graduate diploma or postgraduate certificate or postgraduate diploma in information technology or related subject with at least a B grade average at level 7 or higher. Bachelor’s degree or diploma of at least 2 years duration with appropriate work experience. Completed Concept and Initial Business Plan to be submitted with applicants from non-degree applicants. This programme is completed over 18 academic months. Bachelor’s degree or graduate diploma or postgraduate certificate or related subject with at least a B grade average at level 7 or higher. Students will have completed all requirements of a bachelor’s degree or graduate diploma in a relevant field (such as chiropractic, health science, massage therapy, medicine, naturopathy, nursing, occupational therapy, osteopathy, physiotherapy, sport and exercise) with at least a B grade average at Level 7. Bachelor’s degree or graduate diploma in information technology or related subject with at least a B grade average at level 7 or higher. Academic entry requirements: Applicants must hold a relevant degree. Portfolio of work including examples of freehand drawings and a digital portfolio/showreel showcasing digital storytelling skills. Please visit www.sit.ac.nz for full details on the portfolio requirements. Telephone/ Skype interviews may be required. Handwritten statement. Portfolio of work including examples of film and photographic work. Please visit www.sit.ac.nz for full details on the portfolio requirements. Telephone/Skype interviews may be required. Handwritten statement. Academic entry requirements: Overseas qualification equivalent to university entrance and/or applicants with evidence of relevant prior learning and work experience. Students that successfully complete a minimum of 3 papers from the New Zealand Diploma in Business may transfer their enrolment to the Bachelor of Commerce programme. All applicants must provide a high quality CD or DVD showcasing an audition performance. Telephone/Skype interviews may be required. Applicants with evidence of relevant prior learning and work experience are encouraged to apply. Applicants must have satisfactory physical and mental health that enables them to undertake clinical practice. Telephone/Skype interviews may be required. Pre-entry testing may be required. Prior learning should be at NZQA level 4 standard. Telephone/Skype interviews may be required. Portfolio of work including examples of freehand drawings and latest artwork. Please visit www.sit. ac.nz for full details on the portfolio requirements. Telephone/Skype interviews may be required. Four years secondary education and/ or New Zealand Trade Certificate in Carpentry or National Certificate in Carpentry. Mature students are welcome to apply. Adequate literacy and numeracy and/or appropriate trades training. High school graduates with Science, English, Chemistry and Biology. Students must have a current comprehensive First Aid certificate whilst training for the course (this can be obtained through SIT, Red Cross or St Johns). Telephone/ Skype interviews may be required. Adequate literacy and numeracy with relevant science subjects. Telephone/Skype interviews may be required. ªª Verified passport ID page or verified birth certificate ªª Recent English results ªª Transcripts and academic achievements You may also need to provide the following information (check the requirements of your particular programme from our website): ªª Curriculum Vitae ªª Letter of intent telling us why you wish to study your chosen programme ªª Character or work references ªª Portfolio or business plan All documents must be in English or be translated into English. Start your studies at SIT! Once your visa is approved in principle (AIP) you then pay your fees and book your flights. Advise us of your arrival details and we will book your airport pickup, insurance and accommodation. You can submit your application online or through the nearest Immigration New Zealand branch. Have you applied to SIT before? Which of the following most influenced your decision to apply to SIT? Do you mind members in your homestay smoking? Do you mind homestays with pets / animals? Do you mind homestays with young children? *Students under 18 years of age are required to live in a homestay. *Auckland accommodation is only in approved homestays. DECLARATION I declare that all the information provided by me on and with this application form is correct and complete. I understand that SIT reserves the right to vary or reverse any decision regarding admission made on the basis of incorrect or incomplete information provided by me. I authorise SIT to obtain official records and related information to my application for enrolment from any educational institution that I have previously attended and from any applicable authority such as the New Zealand Qualifications Authority. I authorise SIT and New Zealand government agencies, including Immigration New Zealand, to supply information about me to each other if it is considered to be relevant to my immigration status and/or my enrolment status. I authorise SIT to release academic records or information related to my health and safety to my parents, education agency or other organisation should SIT consider that it is necessary to do so for my wellbeing or educational benefit. I agree to abide by all SIT regulations and policies as may be amended from time to time. I have read, understood and accept SITâ&#x20AC;&#x2122;s Refund Policy for International Students and Privacy Statement available at www.sit.ac.nz. I am aware of the geographical location of the SIT campus in New Zealand at which my programme is offered. International students (including group students) must have appropriate and current medical and travel insurance while in New Zealand. SIT automatically organises insurance for mainstream students through the resource fee. SIT can also organise insurance for English language students and students on exchange programmes. Visas and Immigration Full details of immigration requirements, advice on rights to employment in New Zealand while studying, and reporting requirements are available from Immigration New Zealand, and can be viewed on their website at www. immigration.govt.nz Refunds It is important that you read SITâ&#x20AC;&#x2122;s Refund Policy, available at www.sit.ac.nz. Each request for refund is decided on its individual merits and there is no automatic right to a refund of fees if you change your mind about studying at SIT. Disclaimer While the information provided in this document was true and correct at the time of publication, SIT reserves the right to alter or discontinue programmes, procedures, fees and regulations at any given time without notice. Students should carefully read all official correspondence and other sources of information for students, such as our website, to be aware of changes to the information contained in this document. Medical and Travel Insurance International students (including group students) must have appropriate and current medical and travel insurance while in New Zealand. SIT automatically organises insurance for mainstream students through the resource fee. SIT will also organise insurance for English language students and students on exchange programmes, at an additional cost. Refunds It is important that you read SITâ&#x20AC;&#x2122;s refund policy, available at www.sit. ac.nz. Each request for refund is decided on its individual merits and there is no automatic right to a refund of fees if you change your mind about studying at SIT. Disclaimer While the information provided in this document was true and correct at the time of publication, SIT reserves the right to alter or discontinue programmes, procedures, fees and regulations at any given time without notice. Unless indicated otherwise, information in this brochure relates to SITâ&#x20AC;&#x2122;s Invercargill campus. Students should carefully read all official correspondence and other sources of information for students, such as our website, to be aware of changes to the information contained in this document. NZQA COMPLAINT PROCESS If your education provider has not resolved your complaint, and you still wish to have it resolved, then you can contact NZQA. NZQA is a government organisation. They can provide an independent assessment of your complaint. 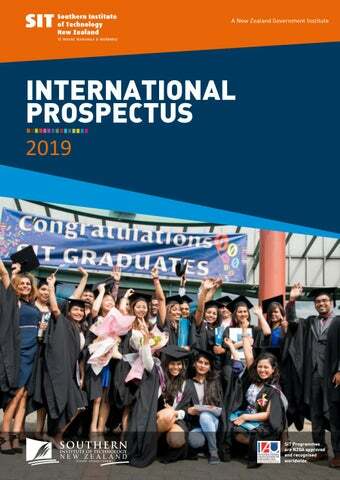 The Prospectus features essential information for potential International Students.